The CODC Performing Unit – Chitralekha Odissi Dance Creation Inc.
CODC selects professional dancers to participate in major productions locally and abroad. Most of these dancers were trained at the Chitralekha Dance Academy and have attained a level of Mancha Prabesha which is the traditional graduation ceremony of an Odissi student once they reach a specific level. Other participants are local dancers who have attained a professional level otherwise professional Odissi Dancers from India. We also sponsor artists from other countries to participate in our performances in Canada. Solo Performances Traditional Odissi Dance Items and/or Specific items are available upon request, performed by any current member of the CODC Performing Unit. Duet Performances Together, Ellora and Devraj Patnaik constitute the ideal union of two dancers, combining technical mastery and conceptual brilliance to form what is arguably the most requested duo in the Odissi world. Their repertoire includes a vast range of existing items, but they will also create, choreograph, and compose new works upon request. Any other two members of the current Performing Unit are also available upon request. Group Performances The Performing Unit consisting of a multiple number of dancers is available upon request for a classical Odissi recital or even a number of dance dramas, even for purposes of touring. 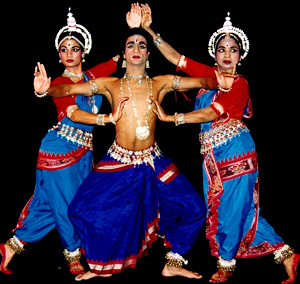 Any Odissi Dance item is available for performance upon request, either by the Performing Unit in its entirety, or by a selection of its members and the same for any Classical Ballet or Yatra, Dance Drama.